So it’s the first week of school. I ventured to the CSA this morning to pick some vegetables – easier, quicker, and much less fun without my boyish entourage. On the way home, I heard a man on the radio talking about raising successful children by teaching them grit and character. (I realize that I am very badly paraphrasing the words of this man who sounded both reasonable and intelligent, and I apologize.) His words really struck home, as we send the boys back into the uncertain waters of a new school year – by turns bright and clear and uplifting, and dark and murky, full of fascinating silt and weeds. They learn from it all, of course! I think it must be impossible for a parent to hear somebody talk about this subject without turning it back on themselves. Am I doing enough to teach them grit and character? How do you even do that? What the heck is grit? What’s character? Secretly, part of you thinks, “Of course I’m doing a good job! Just look at my brilliant boys!” And part of you thinks, “My god, I’m failing completely, they’ll be gritless and lacking in character and scarred for life!” Somebody phoned in a question about I.Q. and academic success – assuming a correlation between the two, and the man said that in fact self-control was more important than I.Q. in determining academic success. Oh dear! I thought…parent-teacher conferences for both boys tend to run, “Your son is so smart and creative, but he’s just got too much energy/he calls out too much/he can’t focus on the assignment…” Sigh. We hit a strange patch last year with Malcolm, when his first “real grades” report card came out, and it was very different from the straight s+ report cards of years gone by. Oh dear! Well, this is when it always helps to take a step back and widen the picture for yourself, and think about the meaning of “success” and how varied and subjective it is. (Of course I want my boys to be successful in every accepted conventional sense, of course I do – life is so much easier that way!) But when you ask the boys what they’re good at, what achievements they’re proud of, they’ll say: jumping off of things, finding an antique bottle in a creek, drawing dragons and robots, running very fast, climbing steep hills. They feel good about these things! And, honestly, any of them can lead to every kind of success, if they’re not discouraged. And I’m glad that they like writing and reading, too, and that Malcolm’s favorite subject is math. They both love school, and that makes me feel very lucky and very happy. And, of course, they’re good little cooks!! 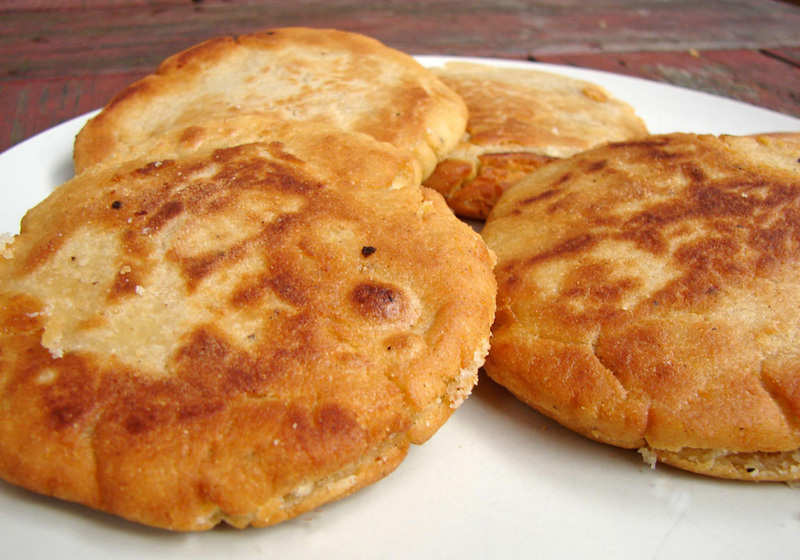 These gorditas were very fun to make, and even more fun to eat! I have to thank the proprietess of Hot Spicy and Skinny for drawing them to my attention, when she read of my struggles making tortillas without a press. I’m not sure if I made them authentically. I sort of combined a bunch of different recipes that I saw, and I used a combination of butter and olive oil rather than lard. They turned out so tasty! Crispy, chewy, flavorful. We split them in the middle, but it might have been easier to pile the peas on top, or even break off pieces and use them like naan. The salsa is the result of my preference for roasted garlic, onions and peppers over raw. I decided to roast everything (well, broil, really) and then mix it all together. It’s yummy! Smoky, a little sweet, a little spicy. 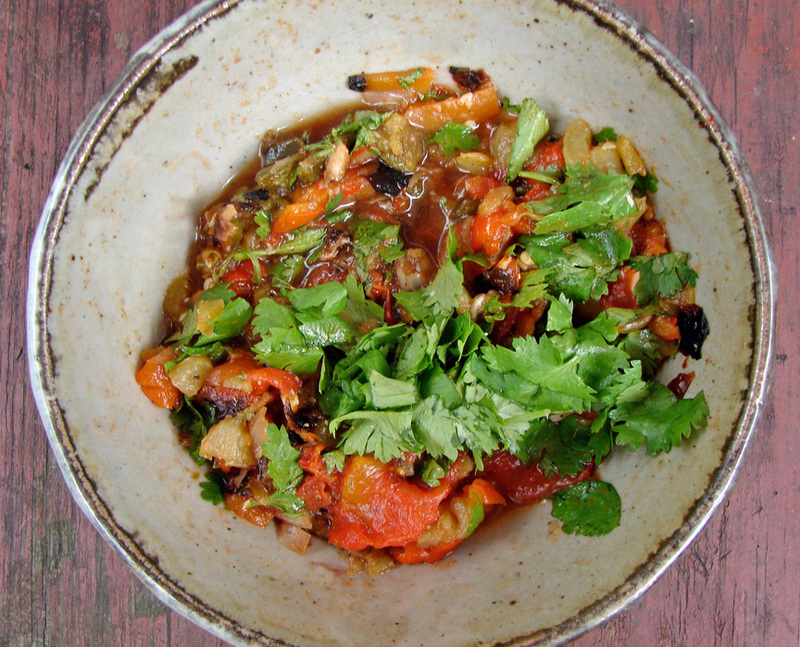 You can use any combination of sweet peppers and hot peppers that you happen to have on hand, and you could easily use onion instead of shallot. 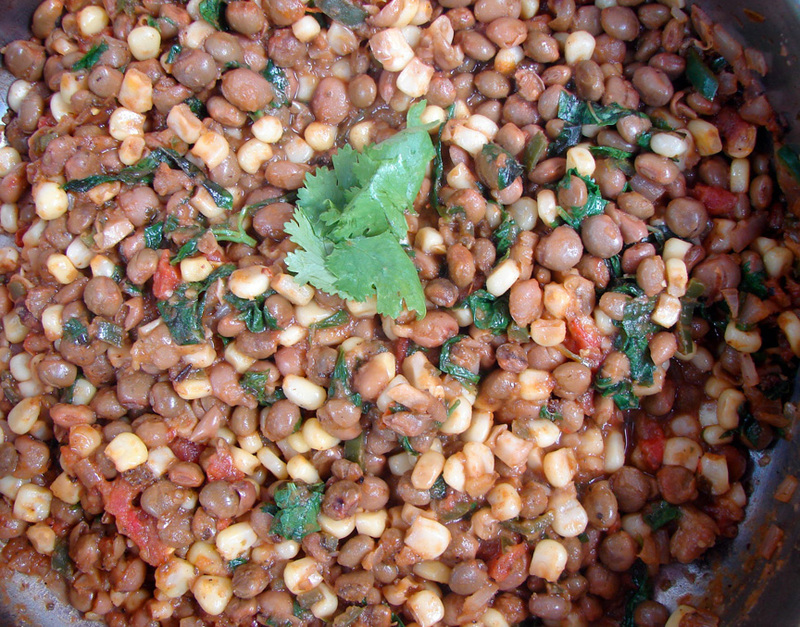 And the pigeon peas match their earthy meatiness with bright sweet corn, tomatoes and cilantro. We ate everything mixed together, with basmati rice and grated sharp cheddar. Here’s Expectations by Belle and Sebastian. Mix the flours, salt and baking powder in a big bowl. Make a well in the center and add the butter and olive oil. Mix with a spoon till you have a crumb-like consistency. Add enough water to form a kneadable dough. I started with a cup and a half, and poured it in a little bit at a time till I had something I could work with. You want it to be quite soft but not too sticky. Knead for about five minutes till it’s smooth and soft, and then put it into a plastic bag to rest for about half an hour. When you’re ready to go, warm a griddle over medium heat. Break off a handful of dough, and kneading and turning it, form a disc about 4 inches wide and 1/3 inch thick. (I made five with this amount of dough. I think I’ll make more next time!) Try to smooth the edges as you turn it, so you mend any little cracks that form. Place the patties on the griddle and cook on each side for a few minutes, till light golden spots form. Then take them off and set them on a platter till you’re ready to fry them. When all the little patties are baked in this way, warm about half an inch of olive oil in the bottom of a wok or frying pan. Fry each gordita on both sides till golden and crispy – a few minutes each. Drain them on paper towels or a cooling rack, and then pop in a warm oven (or toaster oven) to keep warm. When cool enough to handle, slice through them lengthwise with a sharp knife, but not all the way – you want to make them into a sort of pocket, like pita. 1 large tomato, top cut off, seeds lightly squeezed out. If you have a gas burner, you can roast the peppers right on that till the skins are blackened, and then put in a pot with a lid, or a bowl with a tight-fitting plate on it. I don’t have a gas stove, so I arranged everything on a roasting tray. I drizzled a little olive oil and balsamic on the tomato and shallot. Then I moved an oven rack close to the top, and I broiled everything. Once the peppers were blackened on all sides (this took about twenty minutes) I removed them and put them in a bowl with a tight-fitting lid, along with the garlic clove. I continued to broil the tomato and shallot till they were soft and collapsing – another ten minutes or so. After the peppers have steamed for about 15 minutes, you can take them out and chop them up – removing the seeds and tops from the sweet peppers. Dice the jalapeno very fine. Mince the onion and garlic and add them. Then roughly chop the tomato and stir that in. While everything’s still a little warm, add the cumin and paprika and the balsamic. Season with salt and pepper. Right before you serve, stir in the cilantro. In a large frying pan over medium heat, warm the olive oil. Add the onion, and cook till it’s translucent and starting to brown – about ten minutes. Add the garlic, jalapeno, and oregano. Cook till the garlic starts to brown, then add the pigeon peas. Stir so that they’re well coated with all of the flavors. Add the cumin and the broth. Bring to a gentle boil, and cook till the broth is reduced. Add the corn and tomatoes. Cook till they’re warmed through and the tomatoes are a bit soft. Season with salt and pepper. Just before you serve, stir in the cilantro leaves. This entry was posted in beans, bread, recipe, rice, tomatoes, Uncategorized and tagged cilantro, corn, gorditas, masa harina, peppers, pigeon peas, salsa, tomatoes by Claire. Bookmark the permalink. I do worry, and of course parents (and grandparents) always do, and it’s so hard. On the other hand, I had to laugh (privately) at Matt, who was so upset when Jimmy (20 months) started daycare a couple of weeks ago, and he was so sure J wouldn’t be able to function at all in such a different environment. He even said one thing that worried him was that Jimmy knows so many words now, and lots of the daycare kids don’t know any – as if Jimmy would revert to wordlessness if he spent time among them. I did point out that perhaps it would be the other way round, and the kids would pick words up from Jimmy, but this did not go down very well. Neither did me pointing out that EVERY parent since the world began has had this exact same feeling. I should’ve known this would not help.